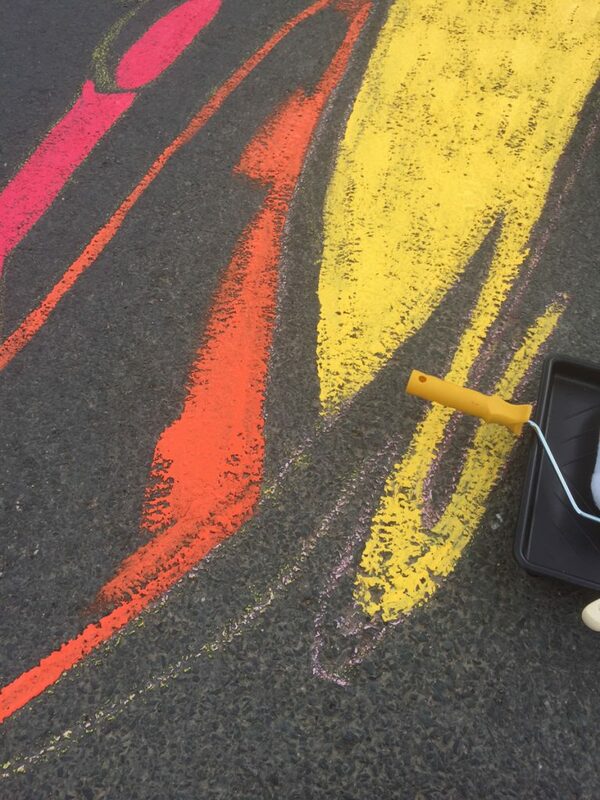 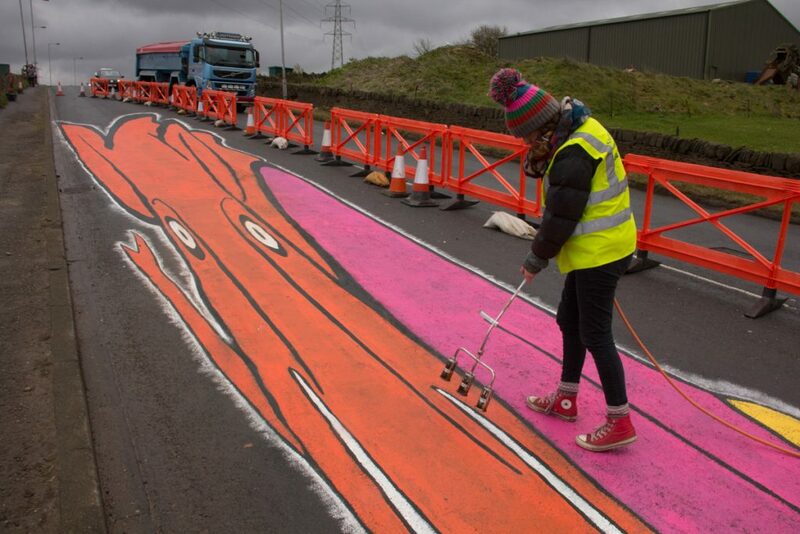 We have always wanted to do a larger scale land art piece on a road, we have done many huge scale pieces of beach art and some land art, so why not try painting on a road! 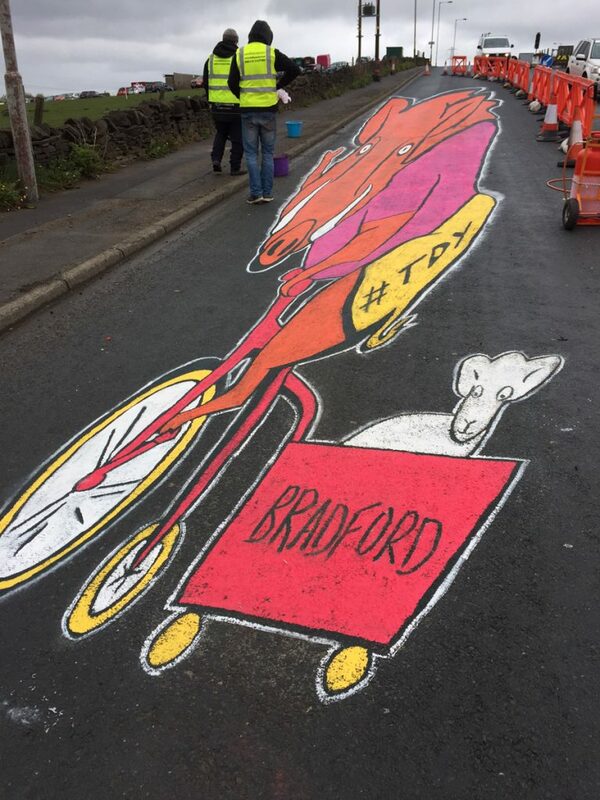 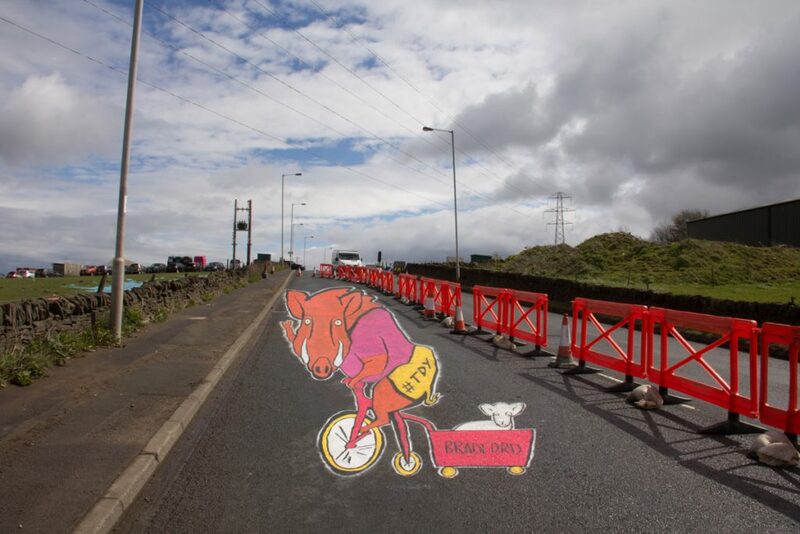 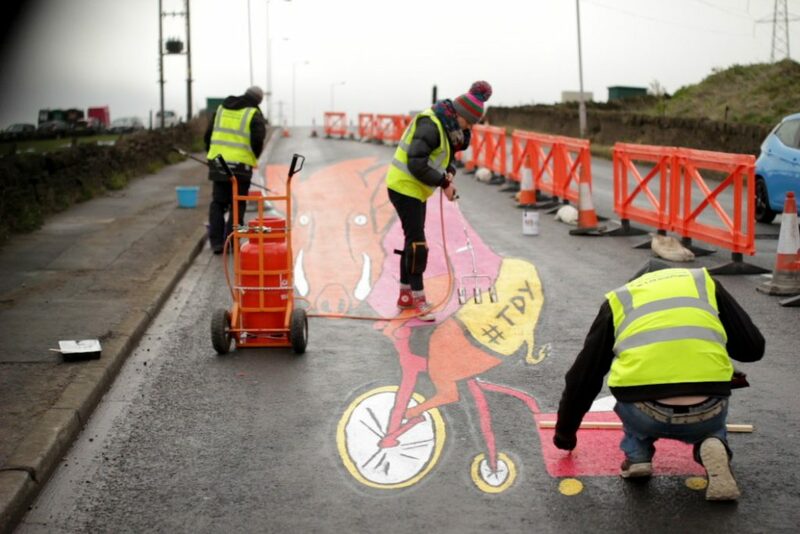 Tom got in touch with Bradford Council, who were looking for local artists to help them welcome the Tour De Yorkshire cyclists as they rode through the city. 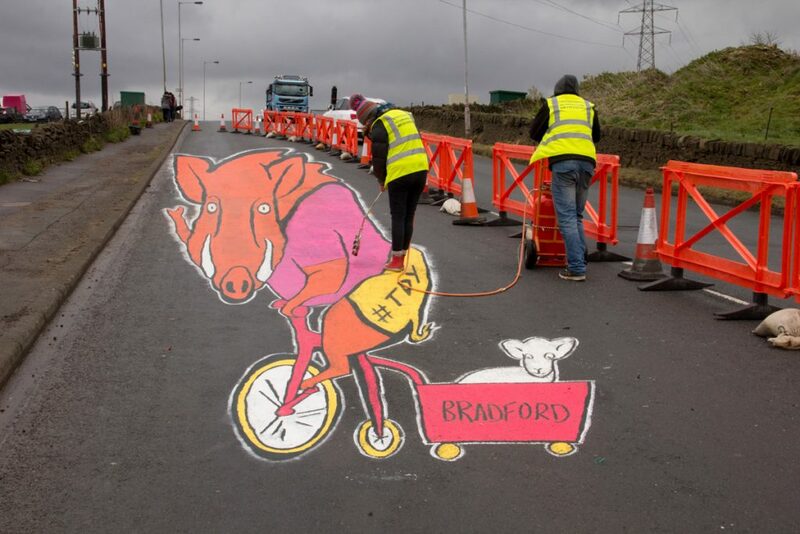 We had seen some of the wonderful pieces of work already being created around Bradford by various local talent, so we wondered what we could do that would be a little different…….. 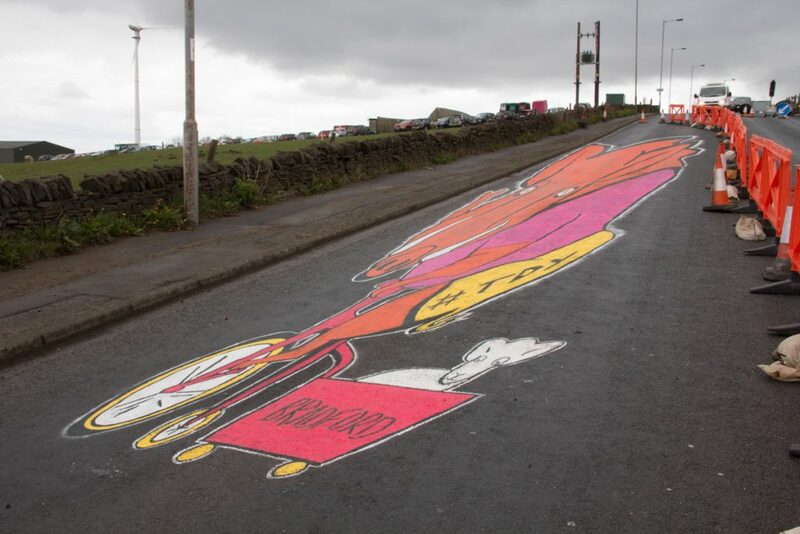 Myself, Tom and Claire had a brainstorm in our van on the way home from another event. 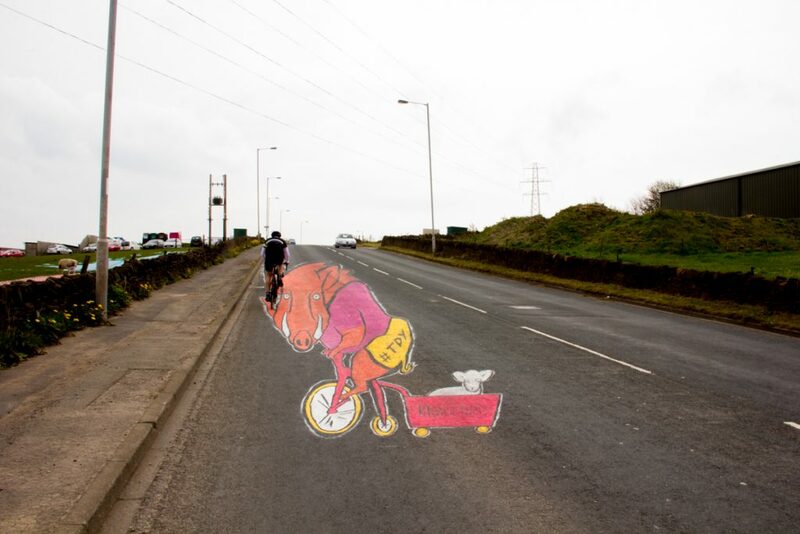 (that’s where the best ideas happen, chatting on long road journeys in the van!) 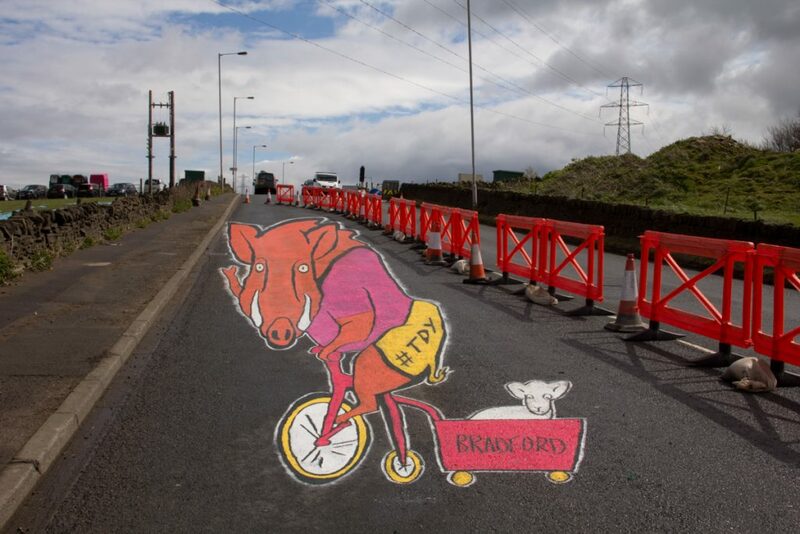 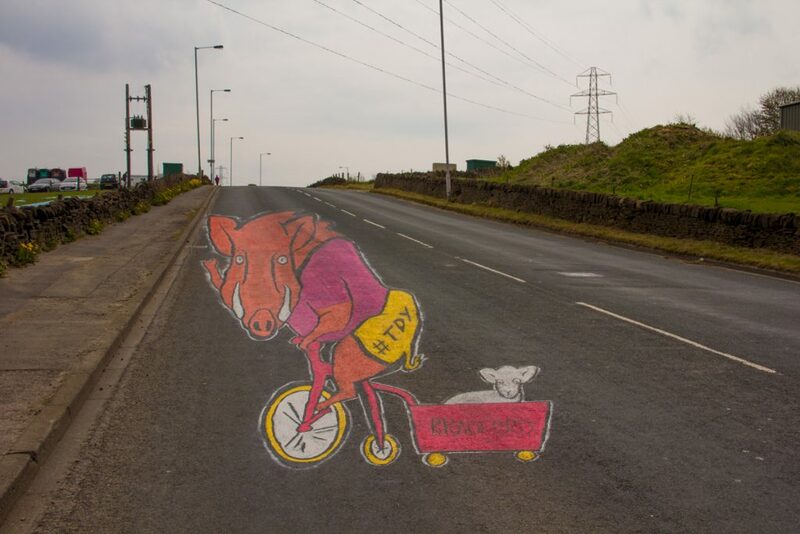 We came up with many different ideas but finally settled upon a boar on a bicycle! 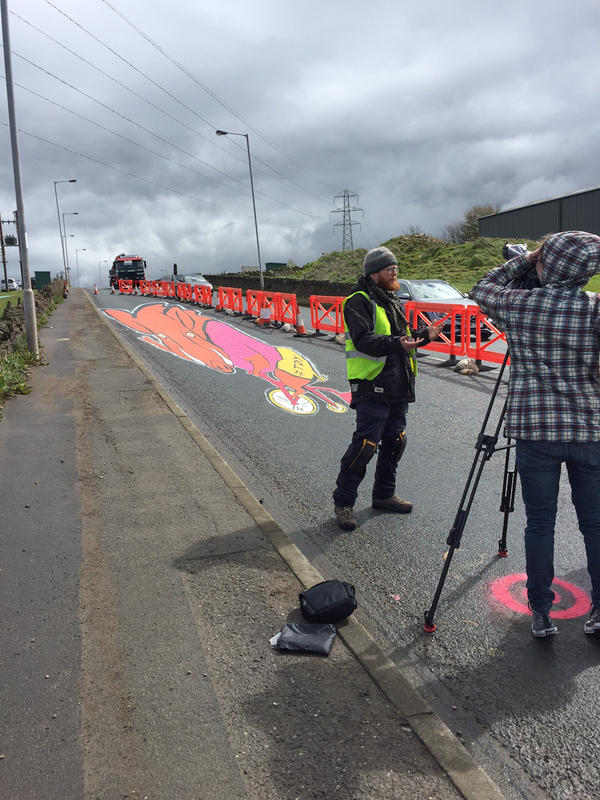 We wanted to do the piece on a long stretch of road with an incline, so we could make the piece anamorphic. 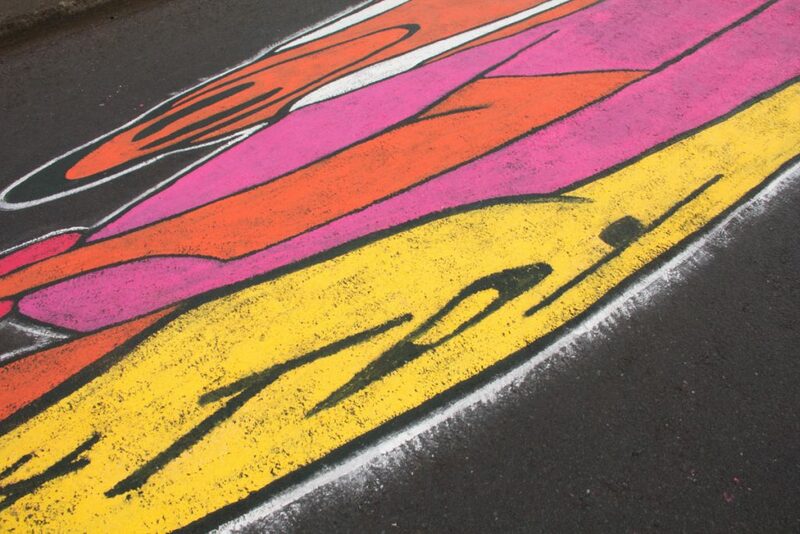 The land art stretched over 30 metres. 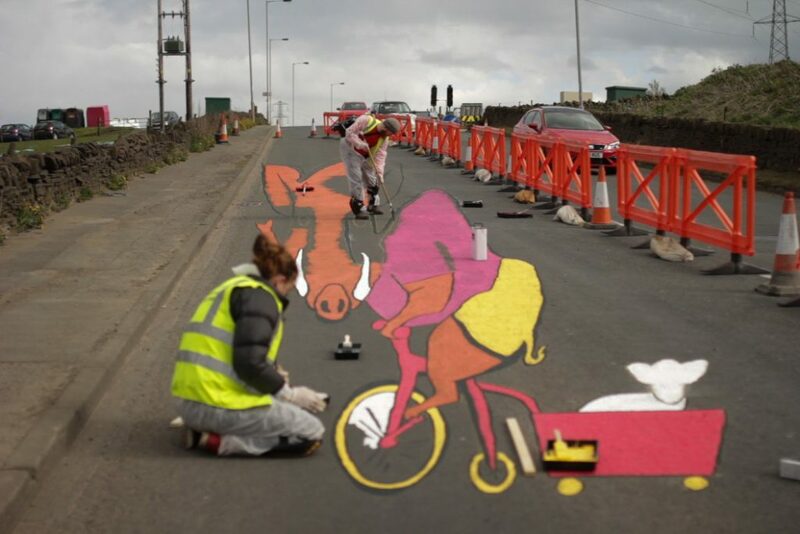 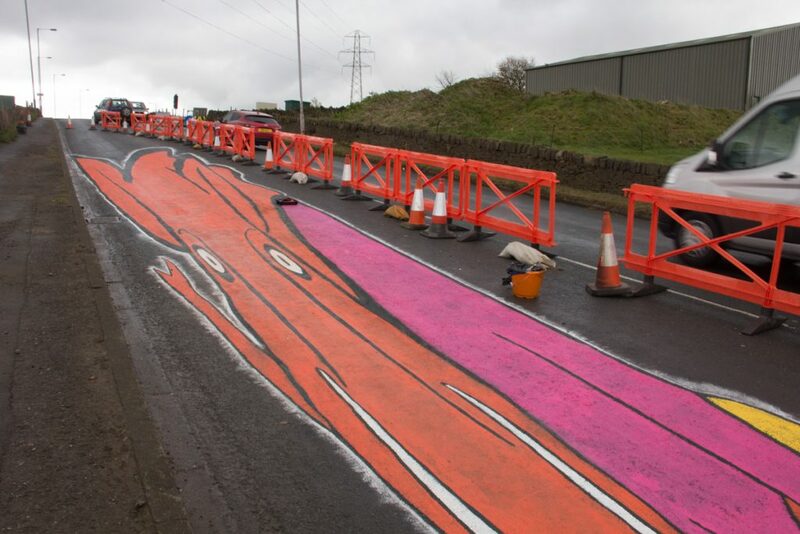 When seen from the correct viewing point (the target we have painted below the piece of work) the image reads as if it is stood up in the road. 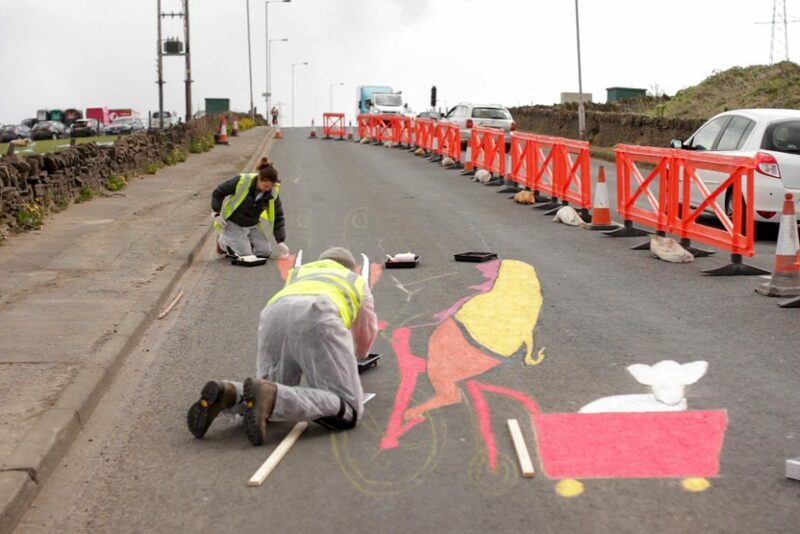 We had two days to complete the piece. We knew that on day one we had reasonably good weather, but day two would have rain from 2pm, so the race was on! 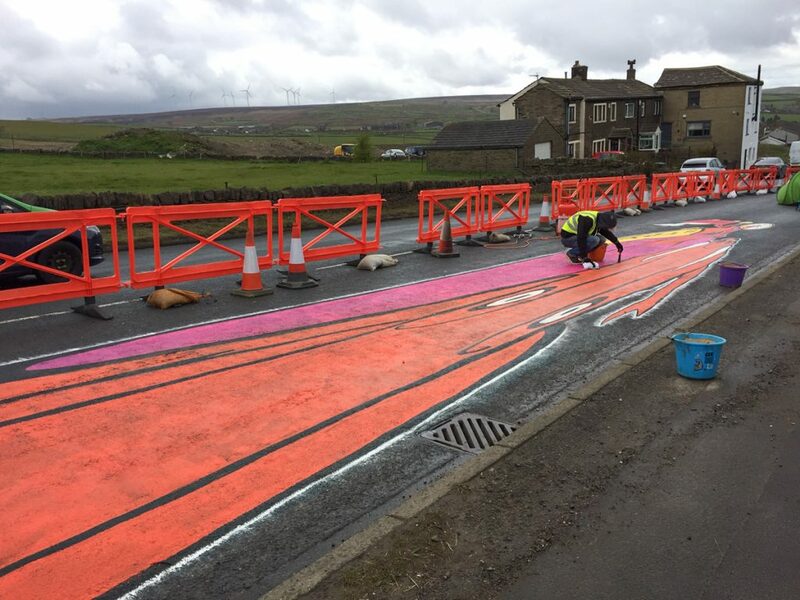 We managed to get all the the first coat of paint down by the end of day one, so it would have plenty of time to dry before the rain came on the second day. 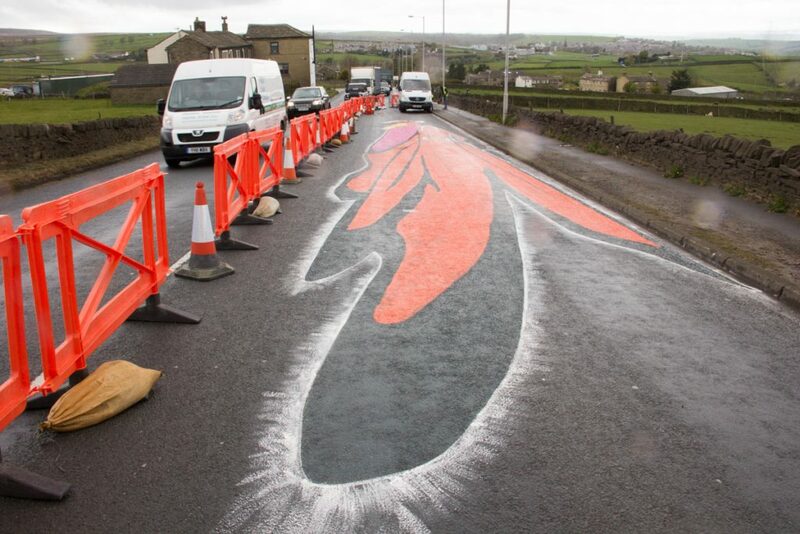 This was certainly a good job, as the next day it rained on and off for most of the morning, so we kept having to stop to wait for the rain to pass before beginning painting again. 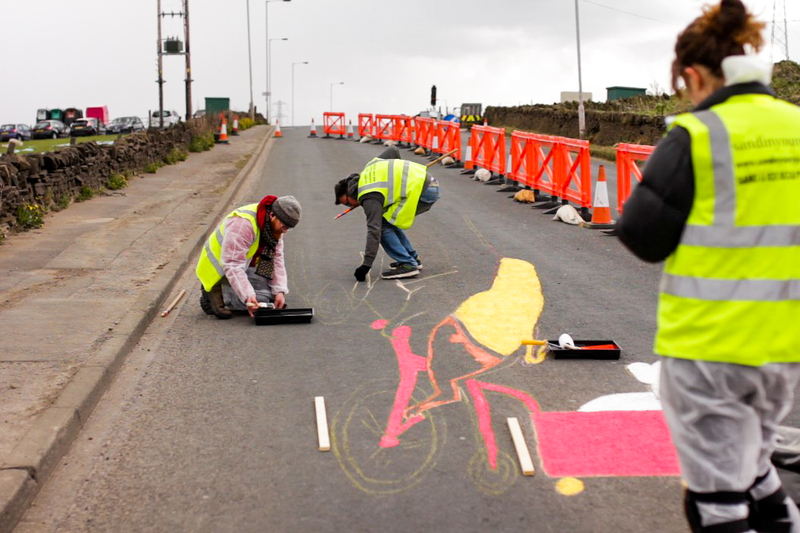 Tom and myself painted in the finishing touches, while Claire, brandishing an industrial blow torch, followed along drying the paint before the rain came again to undo our work. 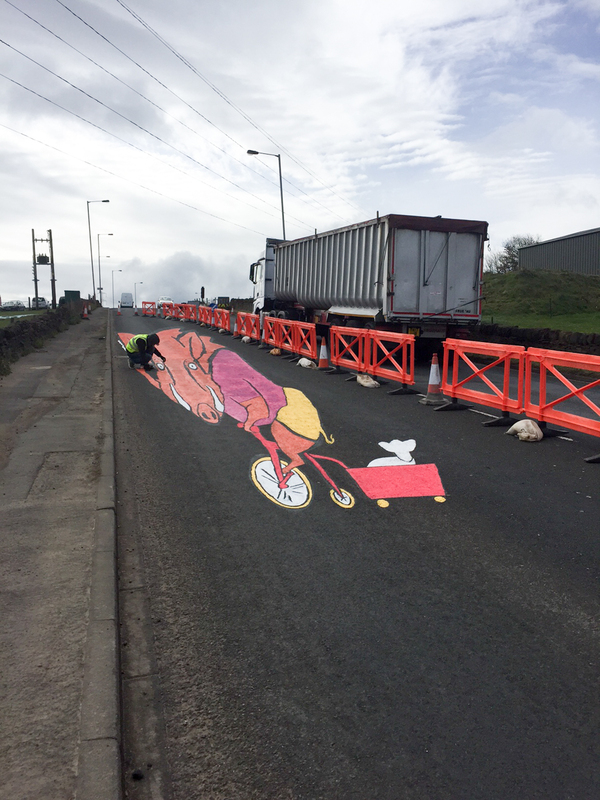 We finally finished the piece around 3pm on day two and we are very pleased with the result! 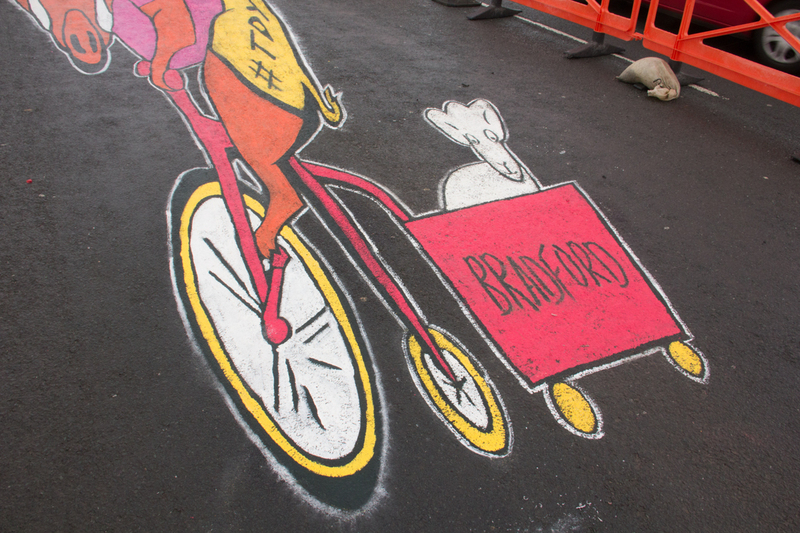 We would like to say a massive thank you to everyone at Bradford Council and the future leaders program, for all of the logistical help to make this happen. 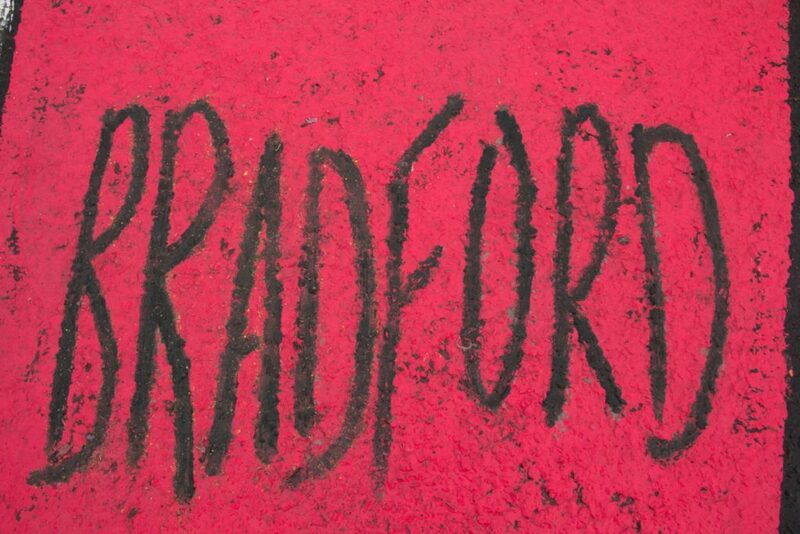 As a Bradford lad, I am always more than happy when Sand In Your Eye get the chance to do something in my home city. 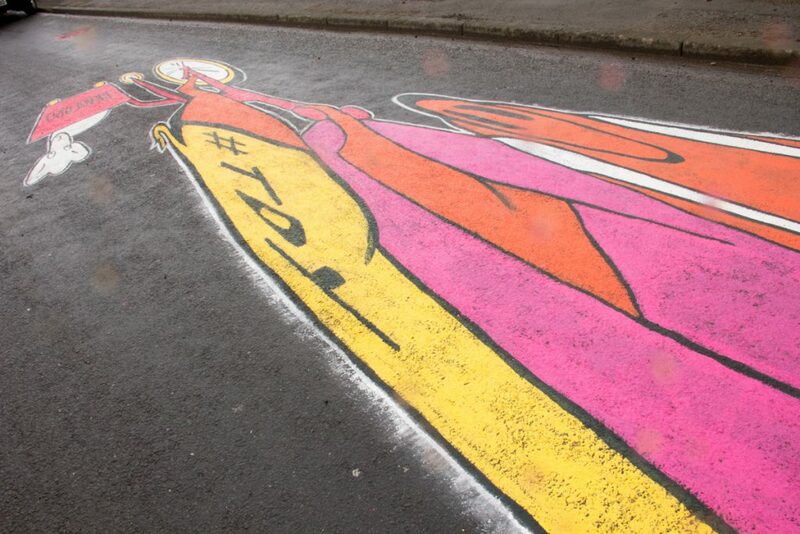 We would also like to thank Green Street Media for the temporary paint used on this piece of urban street art. 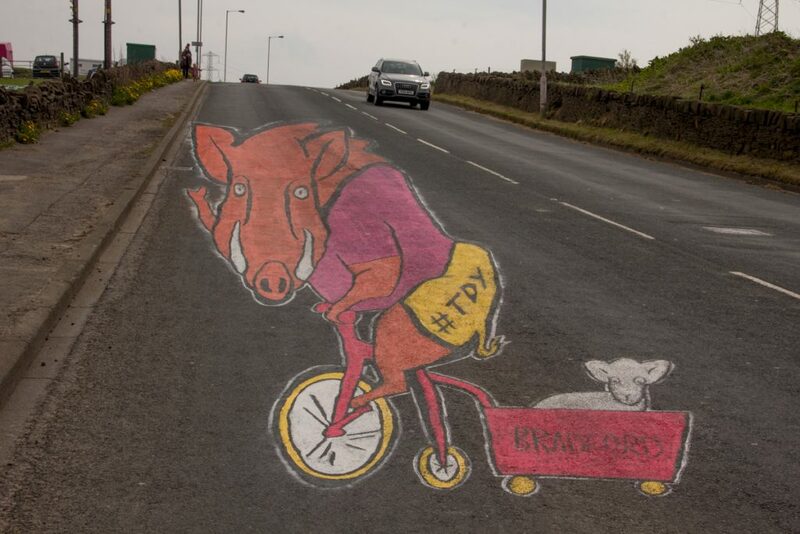 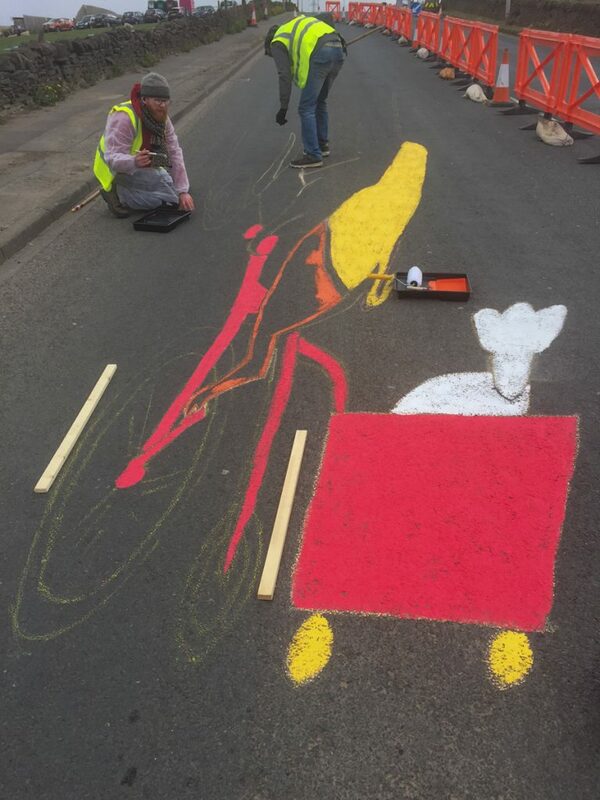 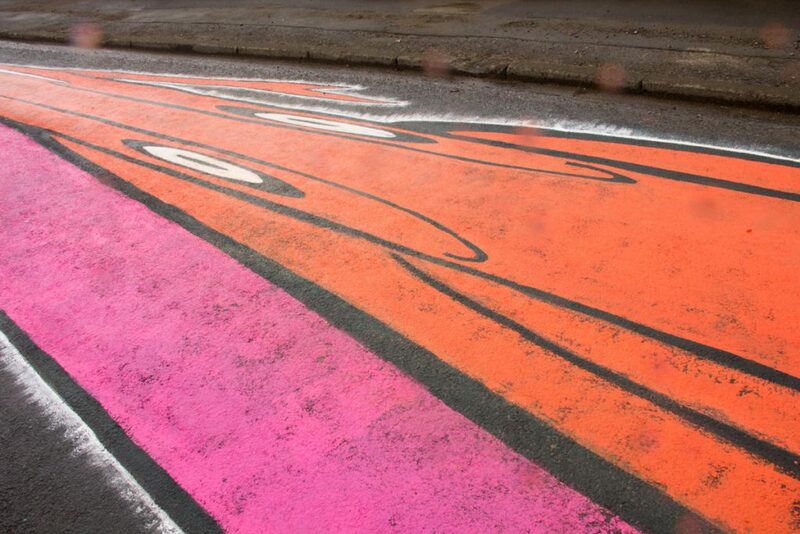 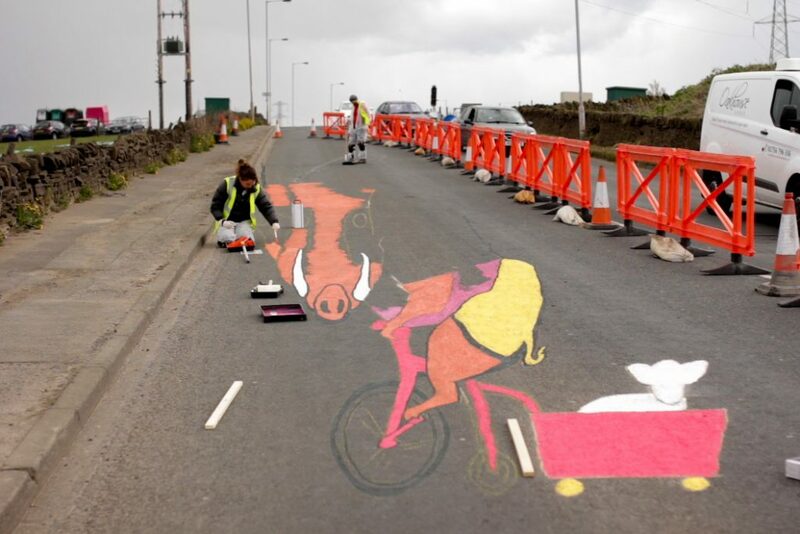 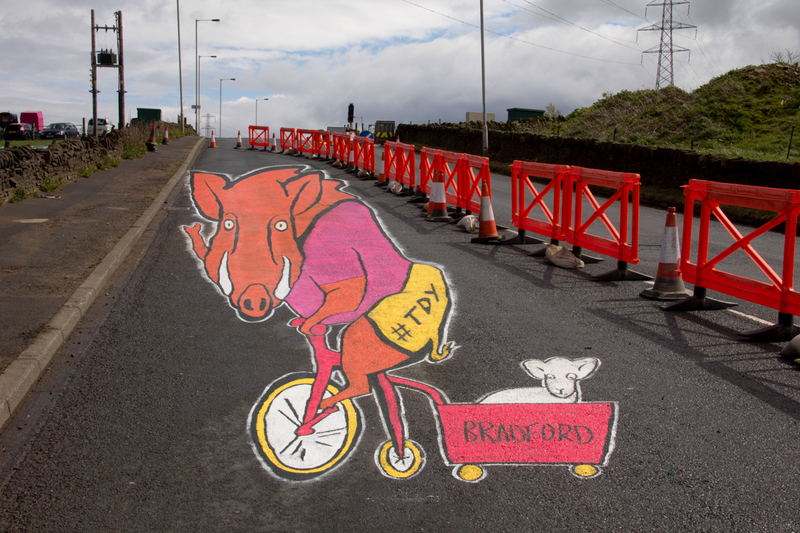 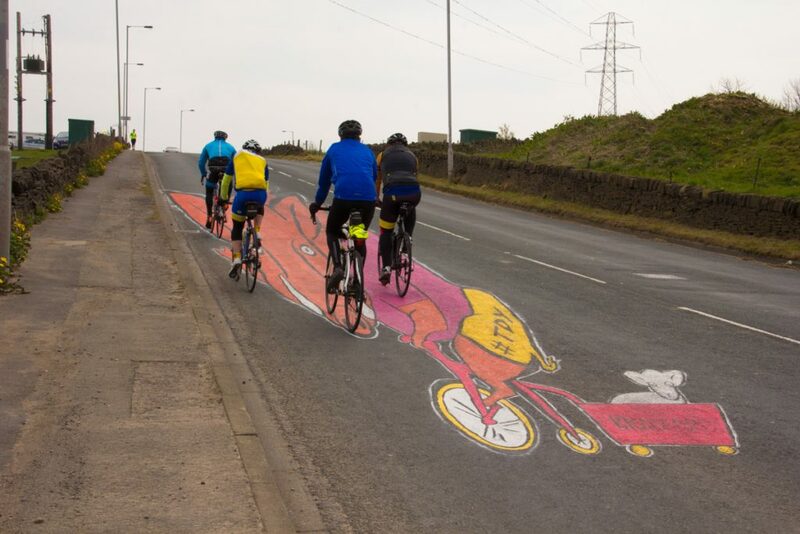 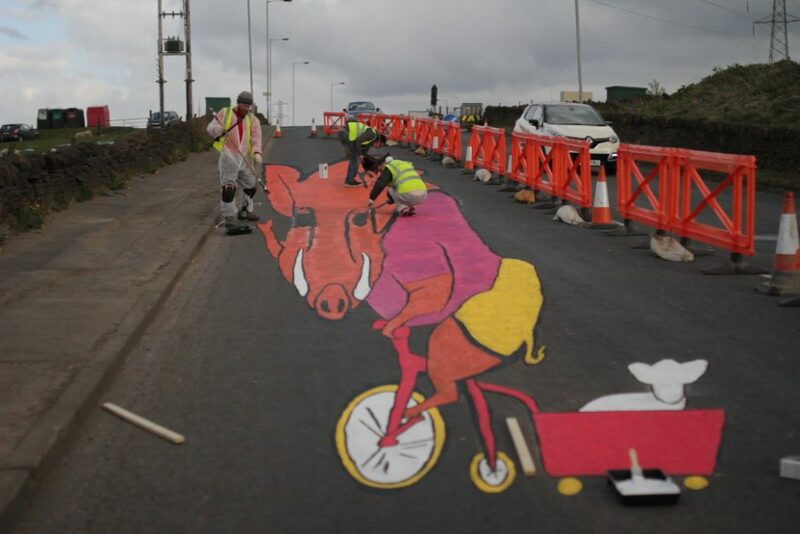 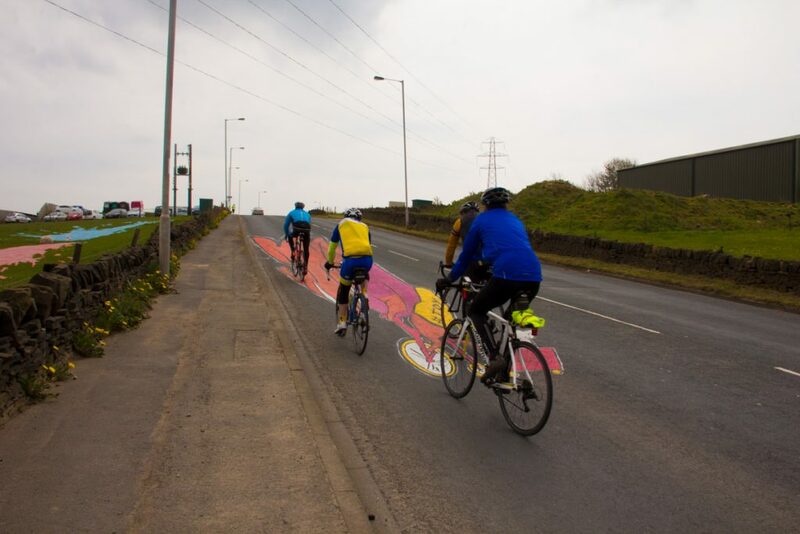 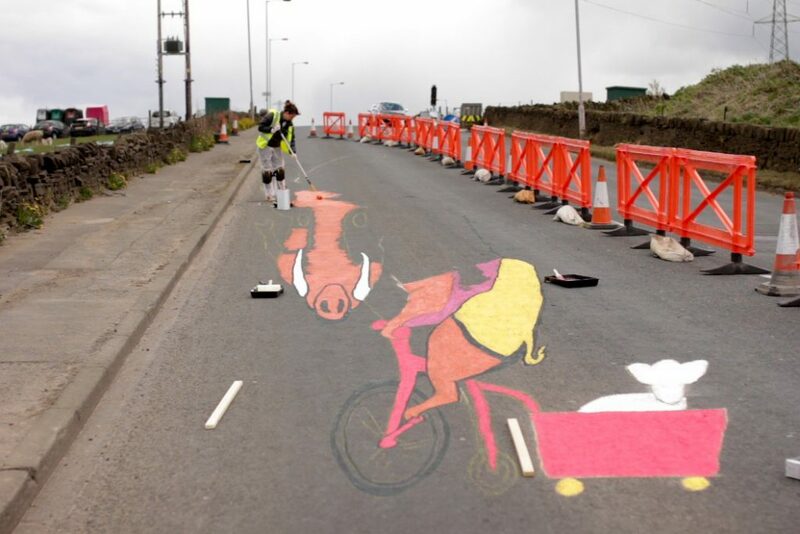 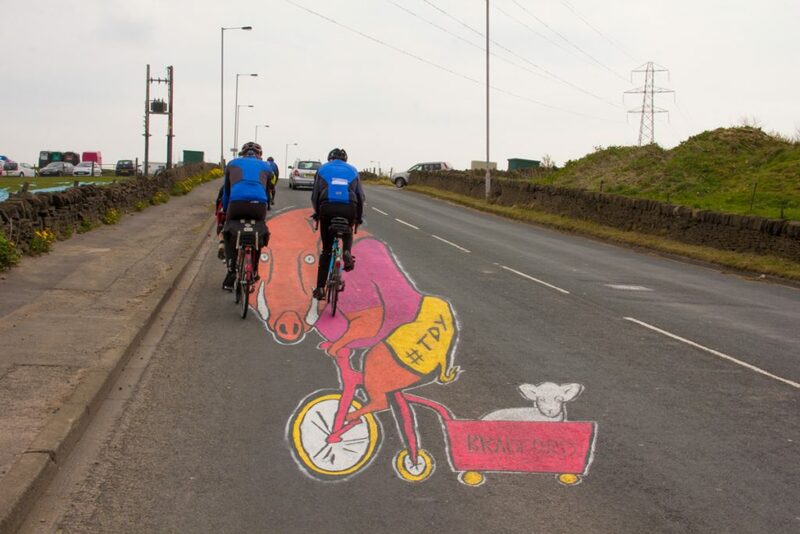 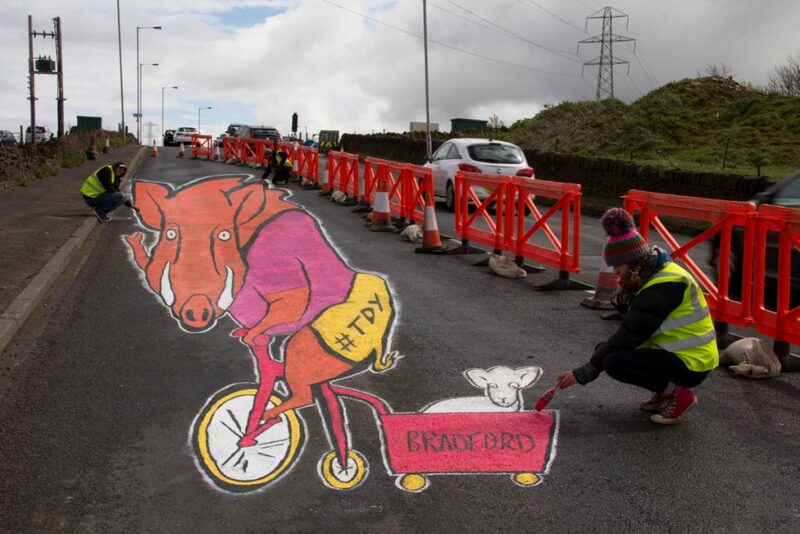 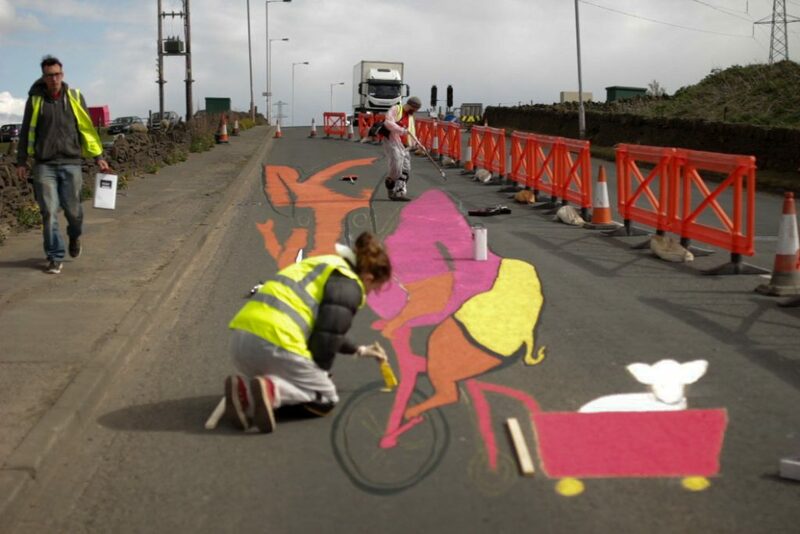 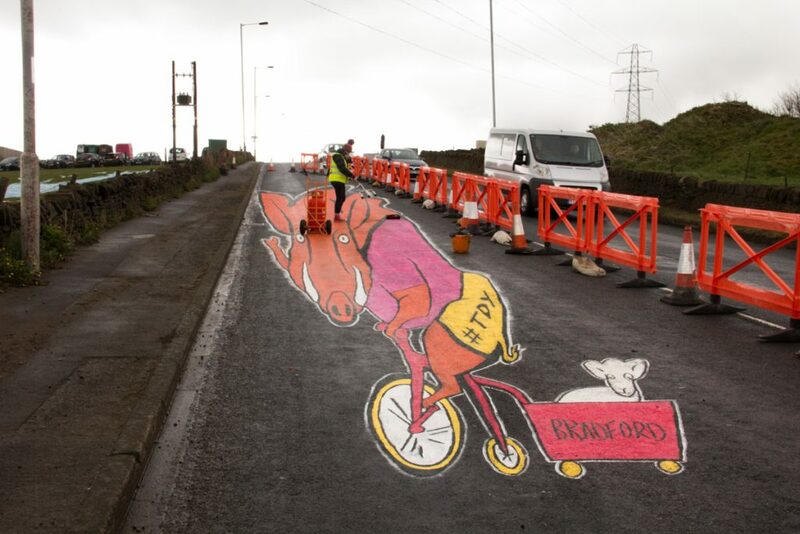 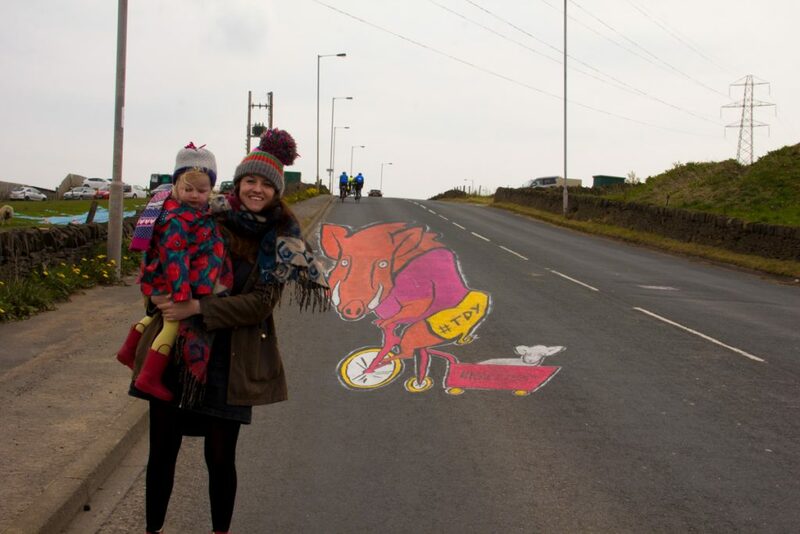 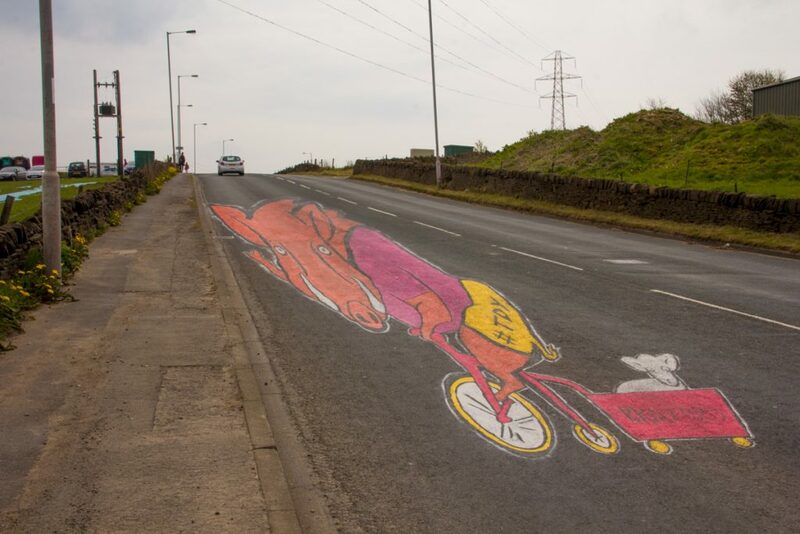 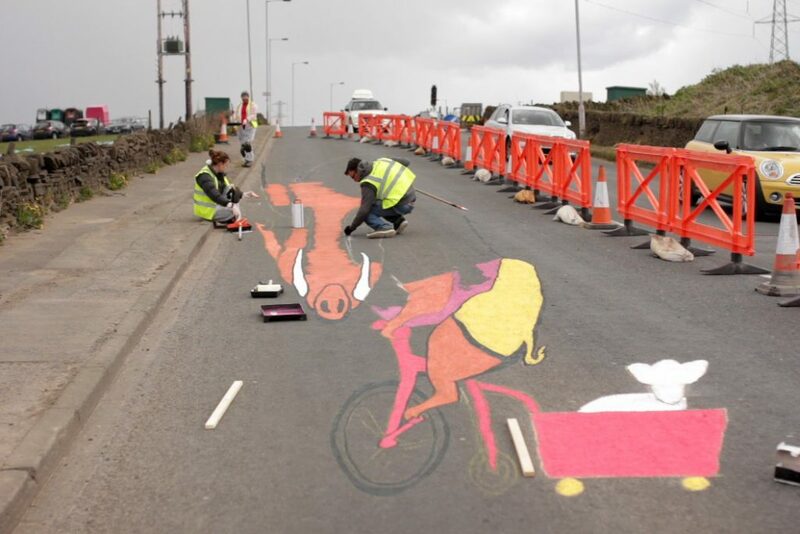 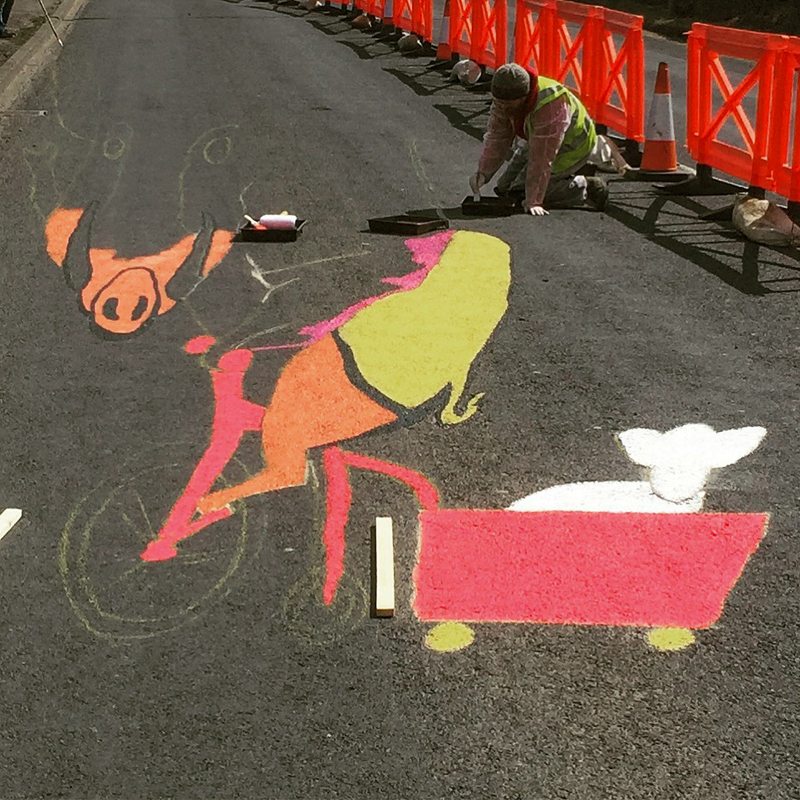 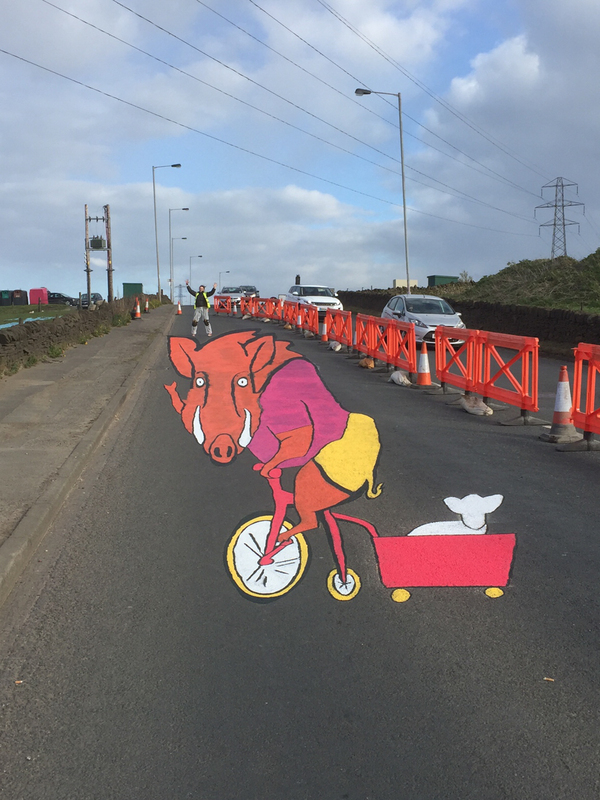 We will be cheering the cyclists on at Keelham on Sunday, hope the cyclists enjoy the road art!